Ngukurr art centre has represented a diverse group of artists from S-E Arnhem Land over several decades. The work continues to show the great cultural variation that comes from the nine different language groups that make up the community. Ngukurr community is located on a river crossing of the Roper River and is cut off from road access to the nearest town of Katherine when the river is in full capacity during the wet season. Ngukurr was originally a mission settlement from 1908 to 1968 established for Aboriginal people displaced from their traditional lands. Since then it has been managed by an Aboriginal Council of elders. The exhibition includes representatives of the current generation of artists working at Ngukurr. They are Wally Wilfred, Alan Joshua, Gwenneth Blitner, Iris Wanambi, Joyce Huddlestone and Karen Rogers. Also represented are some historical works that show the artistic and narrative style developed at Ngukurr. These artists include Willie Gudapi, Djambu Barra Barra, Gertie Huddleston and Maureen Thompson. No one style has dominated from Ngukurr artists but a strong theme of narrative works showing the living conditions of the people with colourful figurative elements has prevailed. Willie Gudapi (1916-1996) painted his ancestral hunting grounds with an abundance of wild food and always included his grandfather spirit on the lands. His style was colourful and representative of the plants and animals that grew in abundance. So also Gertie Huddleston (c1930-2013) painted the bush gardens grown on the mission and the local landscapes as lush tropical wonderlands. 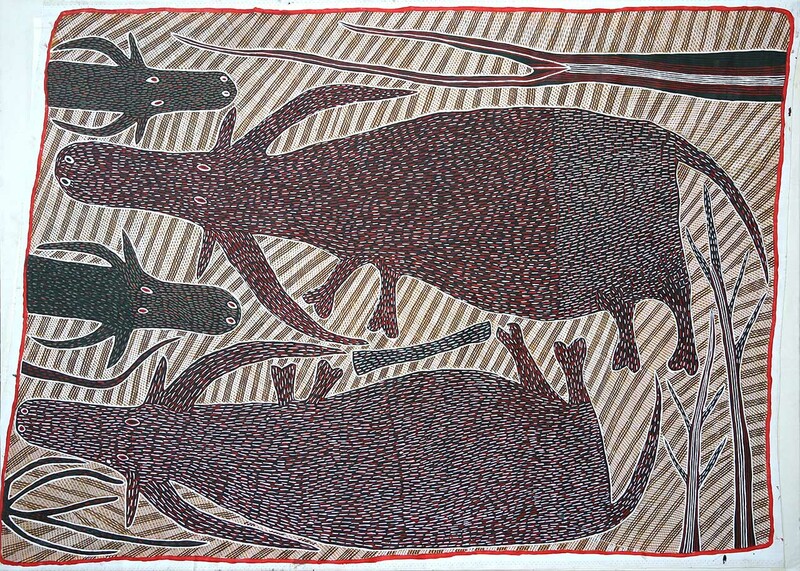 Djambu Barra Barra (c1946-2006) often painted the large animals that were the focus of hunting, and covered them with tribal marks and section lines for when they were to be distributed as meat amongst the people. This narrative style is carried on in the works of Wally Wilfred and Karen Rogers, while Alan Joshua jnr has kept the colour palette but made more abstract images of his community. Gwenneth Blitner shows the more traditional style of Arnhem Land, using the cross hatching rarrk over traditional animals and utensils. The exhibition ‘Artists from Ngukurr’ is on at Japingka Gallery from 22 July to 24 August and is open daily.